One of the best-sounding Blue Notes. True to its title, the music and groove of this album is for late nights and low lights. Thick, smoky, humid – a killer you gotta own. Alfred Lion considered this his favorite production and well he should have. 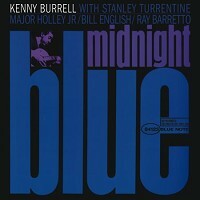 Without piano, Burrell, Stanley Turrentine and company get a clean open sound and a deep groove on such now classic compositions as the title tune and "Chitlins Con Carne," which has become a blues band staple. Customer Reviews (4.92 Stars) 13 person(s) rated this product. I've got a BN original first press which I thought sounded nice. I should have known AP would do it right. One of my favorite jazz guitar albums just went to the next level. Great album. Perhaps Burrell's finest. Good re-issue with good sonics. The original mix on Blue Note is superior, but this is a quiet, good sounding mix that is worth buying and is very enjoyable to listen to. on top of the music being incredible, the quality of the vinyl is fantastic..You will not be disappointed......! two enthusiastic thumbs up! EPIC!!! Will transend time and space! I consider myself very lucky as a subscriber to the Blue Note 45 series. This music is in most cases pretty much unknown to me. I have spent most of my music appreciating years listening to rock LPs bar the odd Miles or Coltrane. So I decided to take an almighty punt on these and the result has been a revalation. I decided to pick this LP to review because I love it so much - but my comments could apply to all the 45 series heard to date. Whilst listening I could not get an image of cool out of my mind - I felt like the early 60's James Bond sipping a cocktail and grooving to this beauty! Why do we spend time on expensive audiophile recordings and even more expensive equipment? Why, because ultimately this LP and may others like it will take you places that transcend normal time and space.